I am a person with ‘A’, ‘B’, ‘C’, and I want a person with ‘X’, ‘Y’, ‘Z’. But is it possible to find a person with the qualities I want? No need to worry. AsianDating.com, is the site which will help you get your perfect date. Many join the site for simply dating and having fun, but many of them have turned out to the life mates. The site has history of making success love stories. AsianDating has helped thousands of Asian singles to get their dates, and is one of the most trusted sites in the world. The members and the connections of the site are very huge. The site is owned by Cupid Media, so whatever information you provide at the time of Sign Up or even after Sign Up, Cupid Media is committed to protect the privacy of their members. At the time of registration some personal information is asked just to provide you the full benefits. They ask you the information like, your full name, email address, local address, phone number, your photograph, your credit card and billing information, your sexual interest, age, occupation, religious beliefs, political opinions and some more. However, you need not to worry about any information you provide, as it won’t be disclosed to any other member unless you confirm. You can sign up using Facebook or email, and either way you will have to provide them with necessary information. Profile tools: Quite a good Profile tools are provided. You can add your photo, or some video (only for Platinum Users), can provide personality information to describe about you in more details. Also has something like cupid tag, which lets you tag yourself with some keywords those are related to your personality or interests. This also lets you to search people with specific tags. The site also provides instant messenger for gold and platinum users. Privacy tools: Privacy tools are also well designed. You can at any time stop some person from contacting you. 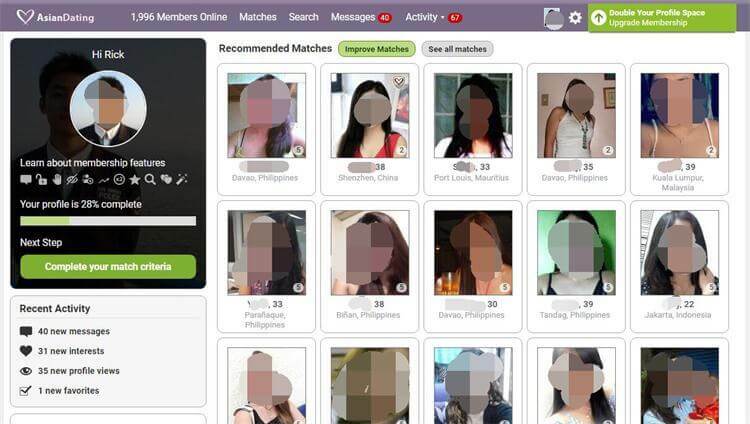 Asian dating site provides you with the facility to create a block list. It is quite easy to report abuse or fake profile. Search tools: Search features are also efficient here. You can do standard search or even advanced search. In standard search you can search by age range, location, sexual, interest, etc. In Advanced search you can specify more minute filters for search like, appearance, weight, body type, lifestyle, or even using any keywords. Besides Gold and Platinum members, standard(free) members are also provided with many features. Standard users can have basic communication over the mails with other members. The site can do match finding for you with automated matching program. Here you just need to input the type of person you are interested in, and the site will provide you many options that suits your needs. Privacy is considered at the priority of all. Video and instant messaging is available for only gold and platinum members.Don not give 100% assurance about any member, so need to careful and alert at every moment. It is a bit difficult to identify the fake account so just be smart. Cupid Media is committed to protect the personal information of all their members. They do not provide any of your information to any other member, unless you confirm it. They take all the actions to protect you from unauthorized access, modification, misuse or any such fraudulent actions. If you deactivate your account then all your information will be deleted and will not be used for any purpose. Commercially sensitive information is protected with more care. You can create block list to stop anyone contacting you at any time. The site has its mobile app also. 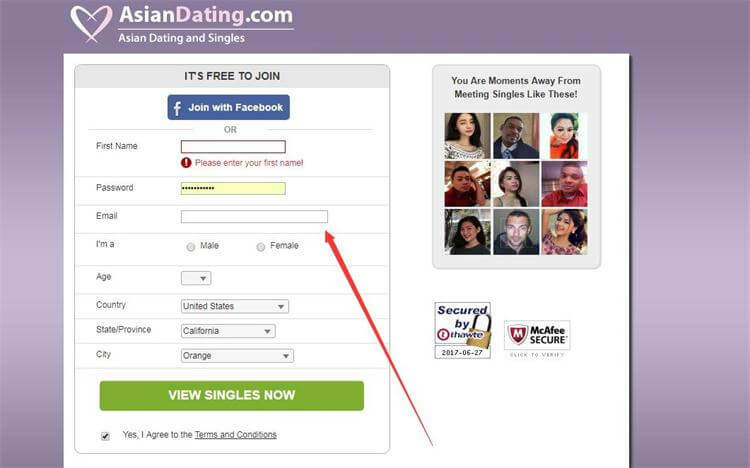 Which can be downloaded from the app store and you will have Asian dating just in your phone. Even the site has exciting features that make the use easy. The site provides automated matching tool, where you will tell your needs and the site will find a potential list of members for you. Also the search provided is very efficient and make the work easy. From the user’s perspective the site is excellent. AsianDating.com has created many success stories, many single Asians got their mates here, and they have even shared their stories on the site. The site helps you to reach the person you want and who best suits you. It is a great site by Cupid Media, that is trusted by millions of Asian men and women. If you are in search of a right match, just visit the site, someone might be waiting for you!